Are you writing fiction or blog posts? 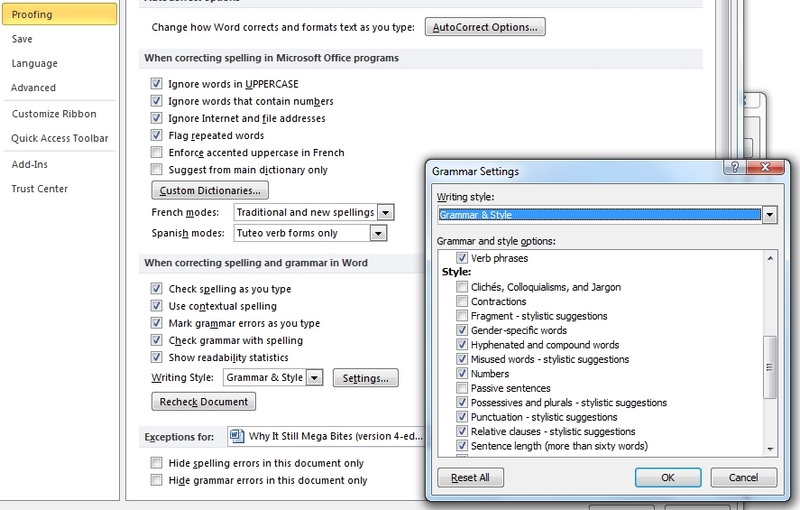 Is Microsoft Office Word telling you contractions are a problem? Incomplete sentences are a problem? And other things that are stylistic choices you're free to make as a writer are problems? No, the rules of writing haven't changed. It's just that Office is now set for academic writing, not any old kind of writing (Why do they think there's only one kind of writing?! ), but you can fix this issue. I found solutions online, but they weren't very helpful, probably because they were for older versions of Word. This solution is for the latest version (although it's possible it might be good for slightly older versions, as well). 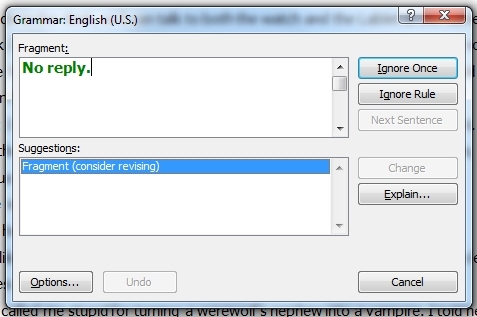 Go through the options and unclick the things you don't want to be corrected on, like fragments and run-ons, contractions, sentence fragments, sentences beginning with and, and so on. Then click "Okay." This will take you back to the previous menu. Near the bottom of the menu on the right, you'll see "Exceptions for." Click to open the drop-down menu and select "All New Documents" and then click "Okay" at the bottom of that menu. And that's it. Yay! You've made those pesky green lines go away! Great tip! 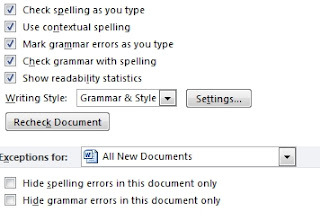 I'm a Scrivener convert, but I clearly recall those warning lines are annoying when you're 99% sure that's the word you want to use. Nice Tips.who can be work on ms word that times we will use your tips.I expect your continuous post.